Rio de Janeiro is the site of the most renowned Carnaval celebrations, but Sao Paulo is trying to rival Rio in size and number of international visitors. The Sambódromo in Rio is 160 meters longer and three meters wider than the Sambódromo in Sao Paulo, having been built (designed by Oscar Niemeyer) on bare land in 1994 especially to the precise requirements of Carnaval. The Rio Sambódromo has a capacity for 90,000 people. Here in Sao Paulo, the Sambódromo, also designed by Niemeyer, was built in the space they had available in 1991, to seat 10,000. It was remodeled in 1996 to seat 30,000. Elsewhere throughout Brazil are other Carnaval centers, including in Salvador, in the north of Brazil, where Carnaval lasts for an entire month, with performances by different Samba schools every night. The difference with these celebrations is that they are “block parties” (sambo de bloco), as originally in Rio and Sao Paulo, with the audience participating in the merrymaking. 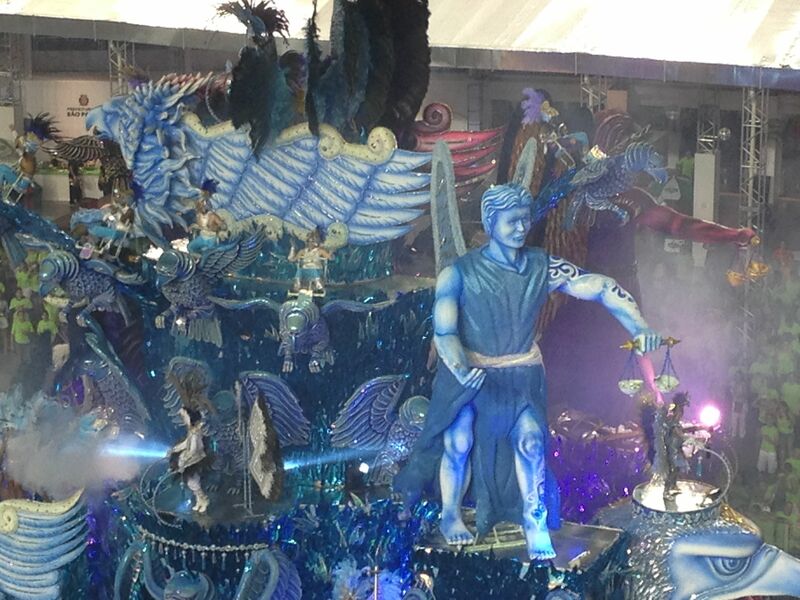 Many other cities in Brazil host their own renowned celebrations, including an event in the Amazon (I don’t remember where) that takes place in May and June, and which is reportedly amazing. The Carnaval celebrations occur on Friday and Saturday night in Sao Paulo, and on Sunday and Monday nights in Rio, giving people to chance to participate in both (if their energy lasts). During the “balls” in the Sambódromo in Sao Paulo, each Samba school is allotted 65 minutes for their show (in Rio, because of the size of the venue, each school is allotted 75 minutes). Each school is judged on and given points for their banner carrier dancing, their enredo (plot), the cadence of the dancers, the timing of the show, presentation, drum corps, duration of the show, etc. At the end of the two nights of competition, from among the seven schools presenting each night, a winner is selected overall, and the two schools with the fewest points are dropped to the second-level Carnaval the following year. In turn, the top two schools from the second-level Carnaval event (here on Sundays) are raised to the first-level for the following year. We were told all of this in the bus en route to the show, but ignorance is bliss, and we were blissfully unaware of (later reported) errors and lack in the shows. 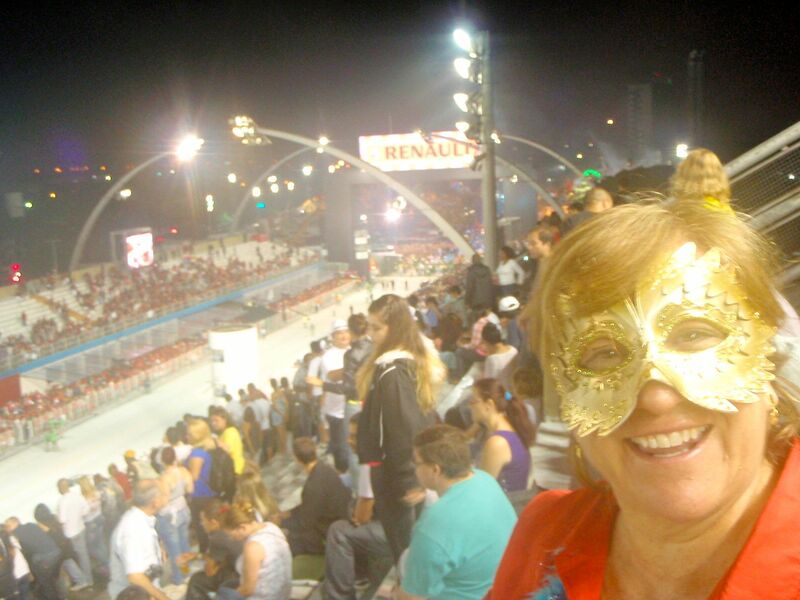 From our perspective, high atop the Sambódromo in the newest section, it was SPECTACULAR! It was an evening of glorious color, wonderful throbbing drumbeats, enormous floats, thousands of volunteer dancers who danced for the sheer joy of it all, and fireworks, confetti, and delightful civility. I’m sure the floats and costumes in Sao Paulo were much less risque than those in Rio, but they were a treat for the eyes, nonetheless. We stood for hours watching each school, and sat on the concrete step seats between schools, recuperating for a few moments while the colors drained from our eyes and relative quiet descended on our ears. On Monday, we will likely attend a sambo de bloco on Paulista Avenue, just to get elbow to elbow with other merrymakers and dance in the streets. Heck, it’s Brazil. How not! Next year, shall we join the dance, or go to another city and experience a sambo do bloco? Time shall tell! Enjoy these photos and videos (uploading soon) from Carnaval Sao Paulo! Why thank you, Lori! I felt great in it and wore it all night long. Forgot I even had it on. Ah, Carnaval! Miss you! Wow – What a great post, Ann! This really seems like a feast for all the senses – thanks for sharing it with us back in the a decidedly UN-technicolor Boston! how we love our Hansons!!!!! Miss you terribly but love how you share your life with us and how adaptable you are to wonderful life adventures. Miss you lots! !